Founded in 2002 in Gladbeck, Germany – EnvisionTec has created some of the most accurate and reliable additive manufacturing systems on the market. While EnvisionTec has a number of 3D printer lines, including a new bio-printing technology, the company's most viable industry machine is its Xede 3SP. Showcasing the firm's largest build volume, the Xede 3SP was designed to satisfy the needs of industries ranging from aerospace to jewelry. Accuracy is at the heart of the Xede design – and helps it stand apart from many of its industrial counterparts. Xede's finished products display no visible stair-stepping and have been used in mold-making, hearing-aid production and even for Hollywood productions. Built into the name of the Xede 3SP is the key to its production technique. 3SP references its Scan, Spin and Selective Photocuring technique, whereby the Xede 3SP uses a multi-cavity laser diode and a rapidly spinning orthogonal mirror to build models. Another important aspect of the Xede 3SP is its upgraded Imaging Light Source (ILS), which encompassed the system's laser diode and optics. When in action the ILS passes across a vat of photopolymer at a rate of 1-2 inches per second, curing any region specified by a user. Given this technology, EnvisionTec has been able to expand its build areas too, lending Xede the ability to create models that are 254 x 381 x 330 mm (10 x 15 x 13 in). International manufacturer Crane Pumps and Systems has been creating their namesake product since 1946. As their business has evolved so has their approach to designing custom pump and impeller solutions. For the past decade Crane has used additive manufacturing to speed up their design process. Yet throughout that time their in-house AM solution hasn't been able to transition their designs beyond the conceptual model phase. To move past this obstacle Crane's engineers began looking into new AM systems that could validate their designs while delivering castable models. 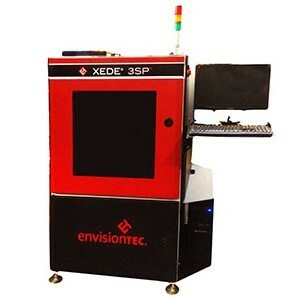 After some research Crane decided on EnvisionTec's ULTRA 3SP printer, a smaller version of the Xede. One of Crane's first projects with the ULTRA was a redesign of hydraulics used in a submersible pump and impeller. 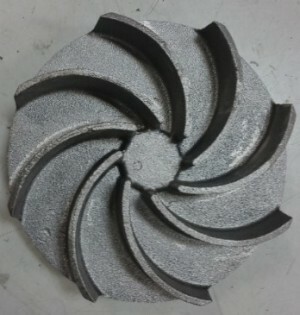 Using EvisionTec's E-Dentstone 3SP material the company quickly manufactured a prototype of their new hydraulic design. According to Don Holder, one of Crane's AM system operators, once the design was produced the testing began in short order. "We can take the part right off the printer. Once we knock the supports off and clean it up we can take it out to the production lab and assemble it on a pump and test the performance of the impeller." Once Crane's new 3D printed hydraulic design was given the green light the plastic part was shipped to the company's metal foundry in Mexico where a sand cast of the model was made. With a sand cast in place metal parts were poured, and within a week of shipment Holder had metal end-use parts in-hand. Ultimately, while Crane wasn't using an EnvisonTec Xede system, the fundamental technology driving their ULTRA 3SP system is the same as its much larger and newer counterpart. With its dedication to accuracy, EnvisionTec's 3SP systems are an excellent choice for company's looking to invest in a mid-price AM system capable of delivering exacting geometries for both functional modeling and casting. Furthermore, 3SP appears to be ideal for firms interested in decreasing the time it takes to design a product. The EnvisionTec Xede 3SP's greatest strength is its ability to build high-quality, large parts. 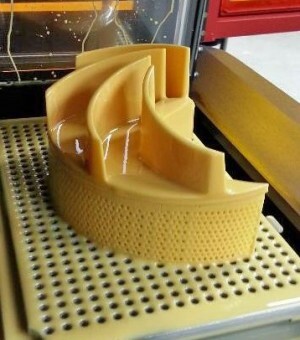 Given that attribute the Xede is an excellent tool for castable parts, wind tunnel testers and functional prototypes. With its large build area and extremely accurate product, the Xede is also a bargain for those looking to include AM in their product design process without having to break the bank. 3D Printers are expensive, and while mid-priced in the market, the Xede 3SP still represents a sizeable investment for many product design teams. Given its price tag and its expensive consumables, it is best suited for high-volume AM users. Those who may be printing less frequently might find other systems within EnvisionTec's portfolio more attractive. Users should also note that while the Xede can build end-use parts for a number of industries, its limited material library cuts short its print and produce applications.